An Italian-style omelet which has the pasta, cheese and eggs mixed together for an easy all-in-one meal. Preheat oven 350°F. Cook pasta al dente according to package instructions and drain. Coat a 9-inch glass pie plate with nonstick cooking spray. In a medium bowl, mix together eggs, milk, salt, pepper and Parmesan cheese. Add cooked pasta and stir until well coated. Transfer mixture to pie plate and spread evenly. 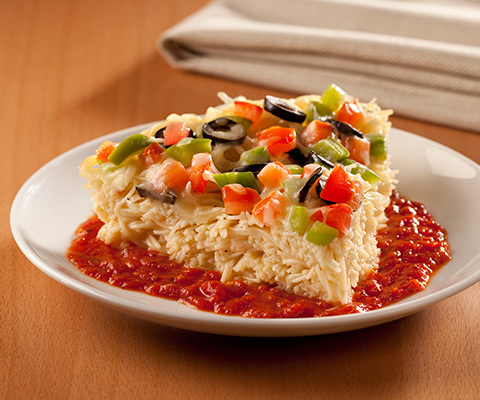 Layer with provolone cheese, green pepper, tomato and olives. Cover with aluminum foil and bake for 20 minutes. Remove foil and bake additional 15 minutes, or until frittata is firm. Slice frittata into 6 wedges and serve with warmed Pasta Sauce. For a little extra kick, substitute Classico® Fire Roasted Tomato & Garlic Pasta Sauce with Classico® Spicy Tomato & Basil Pasta Sauce.